Isaac appeared in a dream in 1985. 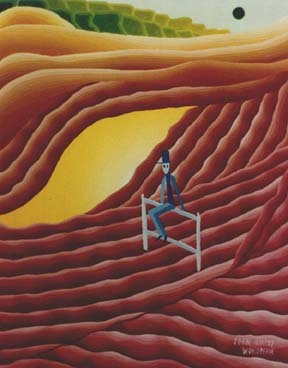 The original vision was of a turquoise man sitting on a fence with a maroon landscape. There was no yellow or brown sand or green hills or sky. Isaac is a man on a fence. His eyes are like an owl seeing all but trying to understand more. There are no other facial features except those that the viewer projects. If you look carefully, he will appear to speak. He is turquoise, the color of the sacred Native American stone. He is spiritual. His hat is a mark of distinction that separates him from others of his kind. It is a mark of rank. The stove pipe hat raises his total height above his peers. His arms and legs are of different colors indicating that there is a distinct but equal balance of his right and left brain. His torso, which encloses his heart (emotions) is of a solid color which symbolizes balance. His head (logic) is a lighter color than his torso but like the torso is of a solid color. His head is also lighter in color than his torso indicating a spiritual orientation. The fence on which he sits is the same color as he is; making it a production of his own imagination. He has materialized the fence so that he can rest for a moment. The fence represents part of his inherent beliefs which form a foundation for his existence in his present reality. At first glance, the fence seems stationary but then it appears to be moving on a river or wave of vibrations in and out among other similar vibrations. The lower part of the work presents a view of a forever changing river of currents. This is symbolic of all the universe. The maroon energy has opened for a moment to give a view of the yellow light coming from the core of this dimension. Isaac has emerged from that core. The yellow opening is a door which Isaac has made with his mind and therefore he must be mindful lest it disappear and he become lost in the moving energy. This symbolizes his need to always remember the source of his being; lest he become lost in a realm of homogenous change foreign to his immortal nature. The sand dunes represent the changing energy of the earth. As the maroon energy represents the forever changing energy of the universe, so the dunes represent changes on the earth. Over time, all things change. On earth and in the universe: "As above, so below." The green rock-like objects at the top of the painting represent a foundation being laid by man on earth. It is a time for building new thoughts and concepts. A new social mind set begins to manifest. The green hole in the sky is an entrance into yet another dimension. Through this hole one can see all that is possible in the coming age.